A Florida Revocable Trust, often called a Florida living trust, is one of the best tools that Jacksonville estate planning attorney can use for clients. The Florida revocable trust is a great way to help someone avoid probate and easily manage and protect assets for a spouse or beneficiaries. A revocable living trust has many benefits that a traditional Will can not offer, but there are some differences between the two documents that should be considered. One of the main advantages of using a Florida revocable trust is that this type of trust allows a decedent’s estate to avoid probate. A Will must be admitted by a Florida probate court before a decedent’s estate can be distributed to beneficiaries. 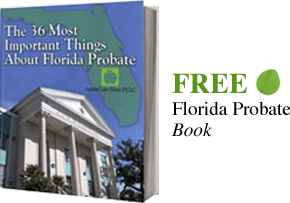 In Florida, Probate is the legal process a person’s estate goes through when he or she dies with assets that are controlled by a Will or the Florida intestate statutes. The problem with probate is that the court has total control, the process is time-consuming, and it can be costly to the decedent’s estate. For example, if an estate is large and there are multiple creditors or claims against the estate, then the probate process can take years. The personal representative of the estate, which is someone the court appoints to administer the probate, is often required to defend against any claims of other beneficiaries or creditors. This means they must hire an attorney and pay the Florida probate lawyer with funds from the estate. Florida also permits charges based on statutory fees for probated estates. According to 733.171, Florida charges presumptive attorney fees according to the value of the estate. For example, an estate in Florida worth $2 million could have fees of $50,000 from the Jacksonville Probate Lawyer. Further, Florida also charges a personal representative fee, which can be equal or in some cases double the statutory probate lawyers fees. Yes, an estate worth 2 million dollars could pay $50,000 in legal fees and as much as $100,000 in fees to the personal representatives who are appointed by the probate judge in Florida. Probate is a public process, which means an interested party can learn all about the probate estate. An interested party can find details about your estate such as the names of the heirs, what the heirs are receiving, and where the heirs live. Solicitors and creditors can use this information as well. In Florida, a revocable trust or living trust is revocable, which means the person that creates the trust has the power to change, alter, amend, or revoke the trust at any time while he or she is alive. The revocable trust in Florida is an actual document that instructs the trustee, or the manager of the trust, on how to distribute the trust’s assets when the settlor passes away. You are typically the manager of your own trust while you are alive, but if you are unable to manage the trust, you, not a court, gets to choose who will manage the assets for your benefit and under your direction. This works just like a Will, however, unlike a will, the trust assets do not pass through probate. The assets in the revocable trust do not pass through probate because the assets are transferred from your individual name to the name of the revocable trust. Under Florida law, you no longer own these assets because the trust owns the assets. The revocable trust’s creator keeps total control of any assets transferred into the revocable living trust. The trust creator is also usually the trustee and the beneficiary, which means the client can revoke or amend the trust at any time. We often recommend other trustees be named in the revocable trust document. Co-trustees or successor trustees can be a huge help if the settlor of the trust becomes incapacitated. The co-trustee can continue to manage the trust according to the trust’s instructions for as long as necessary when the settlor is unable to act. Once the settlor of the trust passes away, the trustee has the duty of administering the estate. The trustee can administer the trust efficiently and privately. Unlike the personal representative, the trustee does not have to follow the strict guidelines of probate and can administer the trust fairly quickly. Like the personal representative, the trustee must pay any taxes owed by the estate as well as any creditors. Any assets that are not in the trust when the decedent dies must go through probate. This is why we often recommend a Pour-Over Will in conjunction with the Florida Revocable Trust. This Will tells the probate court to transfer the decedent’s assets into his or her living trust when he or she dies. There is no asset protection for the Settlor or the creator of the revocable trust from their creditors. The property is treated as if it was owned by the individual who created the trust. There is a Florida Asset Protection Trust that is often used in conjunction with a Florida Revocable Trust to offer protection from the creditors of an individual. Both the revocable trust and the Asset Protection Trust contain provisions to protect the beneficiaries of the trust once the creator or settlor of the revocable trust or asset protection trust passes away. TO SET UP A Free Consultation*, CONTACT A FLORIDA REVOCABLE TRUST LAWYER OR FLORIDA REVOCABLE TRUST ATTORNEY ONLINE OR CALL US AT (904) 685-1200.